What's going on with Penn's Corner? Winter CSA Special Offer Inside! Posted 10/19/2017 8:09am by Penn's Corner Farm Alliance. Sign up now to take advantage of this offer! *Discount is only available to members who have not registered yet and complete their registration now through October 21st. The Winter CSA consists of 9 biweekly deliveries beginning November 15, 2017 and running through March 14, 2018. The Winter CSA is filled with Fall and storage crops like Winter Squash, potatoes, apples, and greenhouse lettuce. It also contains shelf stable items from our farms including grains, maple syrup, honey, and our own line of value-added items. Members can also expect items like eggs and cheese most weeks. This CSA also makes a great gift, think about purchasing one for your family and friends! The deadline to register is November 3rd, so sign up now! 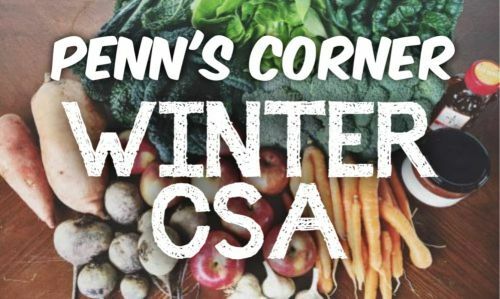 Interested in meeting Penn's Corner Staff and learning more about our CSA? Attend our End of The Season Celebration on October 21st at East End Brewery! Current members who register in advance will receive a free beer! Posted 5/7/2013 12:26pm by Penn's Corner Farm Alliance. KDKA aired an awesome feature on Penn's Corner last night about the Farm Stand and the hogs at Hilltop Farm! Check it out here! 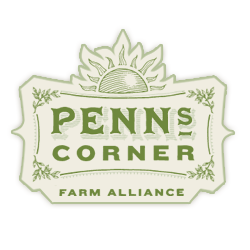 Penn's Corner has a home! Posted 12/5/2012 11:17am by Neil Stauffer. For the first time ever, Penn's Corner now has an office and warehouse space! We can be found at 6400 Hamilton Ave, Pittsburgh PA 15206. We are very excited for our walk-in coolers, space to pack CSA boxes, and office! Posted 12/14/2011 12:05pm by Neil Stauffer. and the Penn's Corner Farmers and Staff are all busy planning for the year ahead. Currently, we are working on crop allocations for 2012, the CSA schedule, pricing and hopefully some new incentives for members! CSA sign up will open in January probably mid-month. Stay tuned! The first week of our Winter CSA Share went very smoothly and staff rather enjoyed packing the boxes themselves! We look forward to continuing this new endeavor. Our Farm Stands continue to be well utilized and will run all the way through winter so be sure to stock up on local eggs, bread, cheese, meat and produce at one of our three Farm Stand locations. You can also get the best that southwestern PA has to offer at our partner restaurants! New Lawrenceville Farm Stand Pick-up! Posted 10/4/2011 9:39am by Neil Stauffer. The Farm Stand Buying Club has a new pick-up location in Lawrenceville at the Stephen Foster Community Center. The first pick-up will take place on October 17th with online ordering begining on the 10th. We hope to see you there! Earth Day in Mt Lebanon! Posted 4/26/2011 2:02pm by Neil Stauffer. Penn's Corner will be joining Goose Creek Gardens and many other great vendors at the Mt Lebanon Earth Day this Saturday! We will be selling and sampling some products, and would love to see you there! Posted 4/19/2011 12:15pm by Neil Stauffer. Our weekly newsletters are no longer those clumsy pdf files that you have to download. Now it’s just a simple blog that we hope will be considered an improvement by all! Click HERE to read the Penn's Corner Weekly Harvest Blog! Each week there is one post which lists the contents for both Tuesday and Wednesday boxes. Recipes we love, current events, news from our farms and recipes from local chefs are also featured on the blog. First boxes of the season! Posted 4/12/2011 12:00pm by Neil Stauffer. Our farmers and staff have just finished packing the first CSA boxes! We are so excited for a smooth start to the season, and hope you love your boxes today! If you haven't joined the CSA yet, sign-up for the 24 week Summer share is still open, even though our Spring share is currently sold out. We would be happy to put you on the waiting list for the Spring shares while you wait for your Summer share to start in mid-June! Sign up online, or send us an email at csa@pennscorner.com to be put on the waiting list. Posted 4/8/2011 10:58am by Neil Stauffer. Looking for some Spring reading? Check out this link for the top 10 Sustainable Food Books from Audubon Magazine!